If you're anything like me (and I would guess you are if you are a fan of Historical Tapestry) then you LOVE stories about royalty. What draws us towards them? Why do we ordinary people find their complicated and glittery lives so fascinating? Leslie Carroll, author of many fiction and nonfiction books focusing on royals at their best and worst, has a compelling idea for why this is. Read below for her guest post and make sure to continue on to the end for a chance to win her newest nonfiction work, Inglorious Royal Marriages, and to follow along with the rest of the Historical Fiction Virtual Book Tour. I believe the lion’s share of my readers live in America where we have an utter, perhaps outsized, fascination with European royalty. They are larger than life; and as such, we find them both amusing and entertaining. And because we don’t have kings and queens and princes and dukes of our own, despite having fought and won our independence from a monarchy, we nevertheless seem to want to fill that void by creating our own royalty. We anoint pop stars, screen goddesses, professional ball players, and reality TV stars and they become “the king of rock and roll,” or “Queen Bey,” or a certain omnipresent family on reality television whose bootylicious princess (twice) sought to outdo the wedding of Prince William and Catherine Middleton. Heaven help us, has America’s desperation to invent our own royalty gotten so out of control that we’ve gone from envying the Kennedys to endeavoring to keep up with the Kardashians? Yet, when it comes to this manufactured “American royalty,” one reason we watch their every move, chart their material purchases, and voraciously read about them in the tabloids is because we want to glimpse our glittering idols as humans: we vicariously smile even as we commiserate with their bad hair days, their drug arrests, their DUIs, their messy divorces. We are almost more interested when they fall than when they soar. What is it about human nature that gloats just a little bit about the misfortunes of others? I think it’s because we somehow need the reassurance that the very people we have placed on those pedestals are in fact, after all, like us—but with glitzier “stuff”—that they are, in fact, relatable. No matter what century they were born in, I have always maintained that the royals I write about are just like you and me—except that they have better jewels, more expensive clothes, and bigger homes. Their glamour intrigues us at the outset, but what lies beneath the shiny veneers are hearts and minds and souls just like the rest of us ordinary folks. They have issues with their parents, or their children. Or they can’t have children, and desperately want them. In most cases, the royal stakes are pretty high, when it comes to producing an heir—but even those of us who are far less lofty still worry about whether the next generation will carry on the family business. ﻿Thank you Leslie Carroll for this awesome post! I have to agree with you that one of the things that fascinates me so much about royalty is this idea that, underneath it all, they are just flesh and bone likes all of us and, therefore, imperfect and flawed. So what do you say, readers, do you agree? Do you have any particular favorite royals and, if so, why are they your favorite? 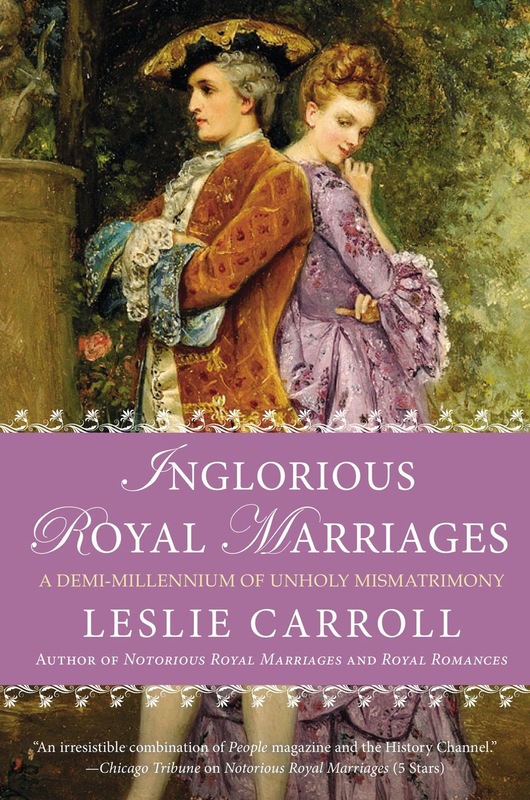 Let me know in the comments below and you're entered to win a copy of Inglorious Royal Marriages! Be sure to leave your email address (no email, no entry!) and for extra entries share this online and leave a separate comment with a link to where you shared. I'll pick a winner on September 10th and the winner will have 48 hours to respond to my email with their mailing address before I'll have to pick another winner. Good luck everyone! Oh I love Lady Di as well! Just like reading about them. The current Queen Elizabeth has been a favorite since I was a child in the 1940s, listening on the radio about her fairy tale wedding and her coronation. Wow, Linda, I would have loved to be able to listen to Queen Elizabeth's fairy tale unfold when it happened! I bet it was magical! Anne Boleyn's a fascinating one for sure! My favorite royals have always been the strong women like Boadicea, Anne Boleyn and Queen Elizabeth, to name a few. I agree with Leslie in that we are all basically the same and have some of the same issues but it is like a fairy tale to read about royalty of any country or era because it is such a privileged life that we can't even imagine, Thank you for the giveaway! Eleanor (or Alienor) of Aquitaine! So far ahead of her time. Master of every game she played. I've always been fascinated by the Romanov family, so mysterious and tragic. I love learning about royal history. I have always been a fan of Anne Boleyn . I was so happy to go and visit Hampton Court ! It was incredible to see where history had been made! I am a keen reader of Historical Fiction featuring royals and the opportunity to visit some beautiful palaces of these royals in Europe certainly fuelled my interest in anything royal. The standout for me was the story of Empress Elisabeth "Sissi" of Austria, wife of Emperor Franz Joseph I of Austria and Mother to son Crown Price Rudolf. Sissi and Rudolf's stories are both equally tragic, Rudolf dying in a tragic murder suicide with his lover and Sissi herself was stabbed to death by an Italian Anarchist. Their stories, along with their beautiful homes I had a chance to visit in Austria still resonates deeply with me. I particularly enjoy reading about the Tudors probably because there is so much written about them but I enjoy learning about all of them. I was able to visit London last year and it was surreal to visit the place that I had read about! Thank you all for your comments!! Using a random number generator the winner of a copy of Inglorious Royal Marriages is....Kara!!! Congratulations Kara! I will send you an email right now and you have 48 hours to respond with your mailing address. Everyone, be sure to keep an eye out for more giveaways here on Historical Tapestry!